Last week’s training day for the Parliamentary Shadowing Scheme perfectly encapsulated what the scheme is all about. A great feature of the scheme is the window of insight it offers Black and minority ethnic (BME) individuals into the daily life of a professional politician. The training days add another dimension to the scheme by providing participants (known as Shadows) valuable face-to-face time with speakers who know how Westminster works inside out. It is not every day that members of the public meet a former Minister of State but that’s exactly what happened at the day when the Shadows were privy to a meeting with the Rt. Hon Keith Vaz MP who passed on invaluable advice and insights from a wealth of political experience that includes 23 years as an MP and an array of ministerial appointments. Vaz’s insight was one peppered with personal experiences that came from someone having a genuine and frank conversation. It was not the kind of sound bite politics people are used to hearing from politicians on the TV, radio or newspapers, but instead sincere wise words conveyed in a constructive space that only a programme like the Parliamentary Shadowing Scheme could provide. You might think that telling this to a room full of people, with aspirations of public office, might be a depressing affair, but you would be wrong. Looking round the room of fully engaged and switched on Shadows; it was clear the realism that Keith Vaz sought to impart was appreciated by a group of people that in their professional and personal lives have already exhibited a tremendous amount of determination and proactiveness. Keith Vaz’s message steeled their own political ambitions by making them fully aware of the road ahead but also by vividly demonstrating how perseverance is a virtue which will be rewarded. Next to address the Shadows was OBV Director, Simon Woolley, who explained how in the 21st century it is necessary to keep your politics principled, even when times are hard because ultimately it will pay off, even if it doesn’t seem it’s going to at the time. The training day culminated with a trip to No. 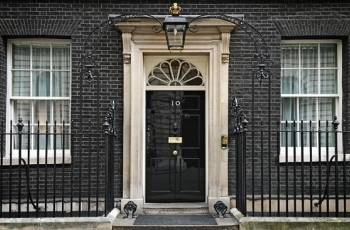 10 Downing Street, the home of the Prime Minister and arguably home to the most famous door in the world. Undoubtedly, it was a prestigious invitation, which is bestowed upon very few who are not political dignitaries. Yet, this visit was not about the prestige or a nice photo opportunity. The intentions behind the visit lay precisely in what was behind the heavy door of No.10 Downing Street. The intention of the visit was to make less opaque the political environment that the decision makers at the top immerse themselves in on a daily basis. The Shadows were able to take more than just a photo; crucially they were able to take a mental picture of where their ambitions and determination could really take them. ‘Let’s hope that a BME individual is soon here by right’ said Shadow, Philip Olanipekun. As part of the visit, the Shadows were told that everyone had to knock on the No.10 door to enter, and at the day’s end it was not hard to see a time very soon when these shadows would be knocking on this very door as an MP, Cabinet Minister or even Prime Minister. Shadow Jacqueline Kibacha also shared her experience of the day over at her blog.